I did this pencil sketch at the beach today. 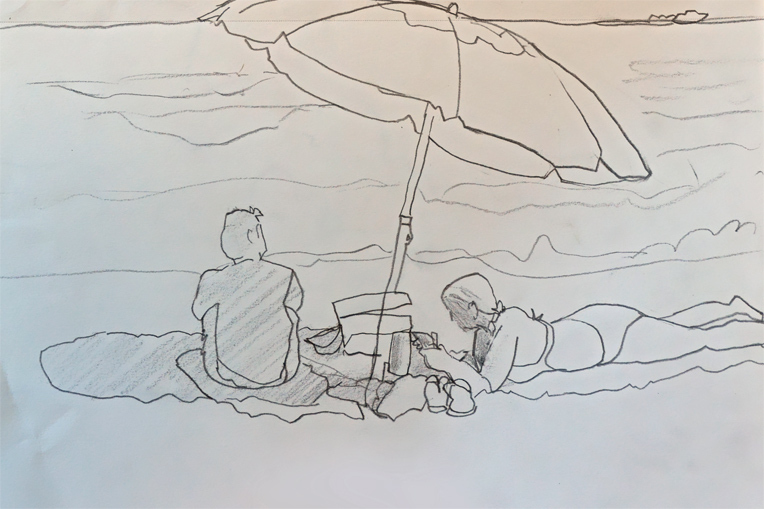 The people in front of me were enjoying a beach blanket day and I decided to draw the umbrella, water, waves and the people. Again I tried to keep my pencil on the paper without lifting it for as long as I could. I started drawing the man and moved right to the blanket, cooler, drinks, sandals and onto the woman. I wanted to get this part finished before they moved. Once I got the basic details I did the umbrella and water. I will be painting this beach blanket day in watercolor and maybe pen and ink. I should have it finished by Tuesday and will post the painting here on my blog. I am also working on a small oil of a sand dune and should finish that soon. Check back in a few days to see how the beach blanket day from Fort Lauderdale, Florida comes out. Creating Textures in Watercolor – Guaranteed to Improve Your Paintings!